There are three good times to make raspberry jam. Firstly with fresh raspberries if you have them growing in your garden. Secondly with fresh raspberries in mid-summer, when they’re at their lowest price in your local farmer’s market or supermarket. And thirdly with frozen raspberries. So basically any time is a good time as frozen berries work just as well as fresh ones and they’re considerably cheaper. With frozen fruit the jam ends up a darker red, as you can see in the photo. Holidays spent as a child with my Dad’s cousins at Hill House, a dairy farm in the very north of England, had a huge impact on my love of cooking. From Great Auntie Vina and Little Mary I learnt how to bake a full repertoire of cakes and pastries. And my Dad’s cousin Big Mary, so-named in order to distinguish her from her brother’s wife Little Mary, who was much shorter, taught me to make raspberry jam. She also gave me the recipe for a spectacular dessert called Mexican Bombe which I make for special occasions. It’s not on the Weight Watchers diet, but everyone loves it. Unopened jam keeps for several months without refrigeration, but Big Mary said it was best to make a kilo or even half a kilo of raspberries into jam and keep the rest in the freezer to make another batch at a later date. 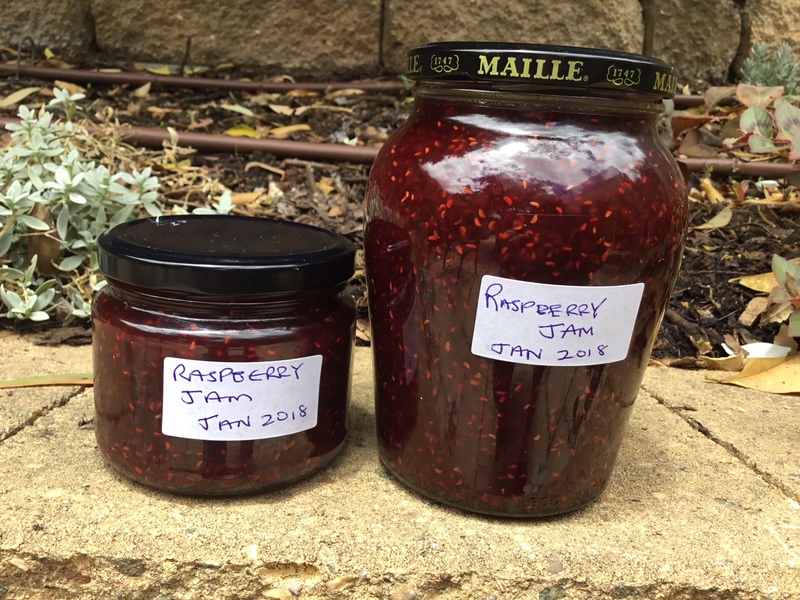 Freshly-made raspberry jam, she said, was much nicer than jam made a few months ago. With experience you will know when jam has reached setting point, just by looking at it. If you’re new to jam-making the best way to check for setting point is as follows. Put a saucer in the freezer before you start, so it gets very cold. When you think the jam may have reached setting point (which varies according to the acidity of the fruit from 5 to 20 minutes) place a scant teaspoonful onto the cold saucer then put it back in the freezer for a minute or until cold. To avoid over-cooking most cookbooks suggest you take the jam off the heat while you’re testing. Push the cold jam with your finger and if it’s ready you will see that it’s starting to gel. If it’s not ready it will still be liquid when cold. 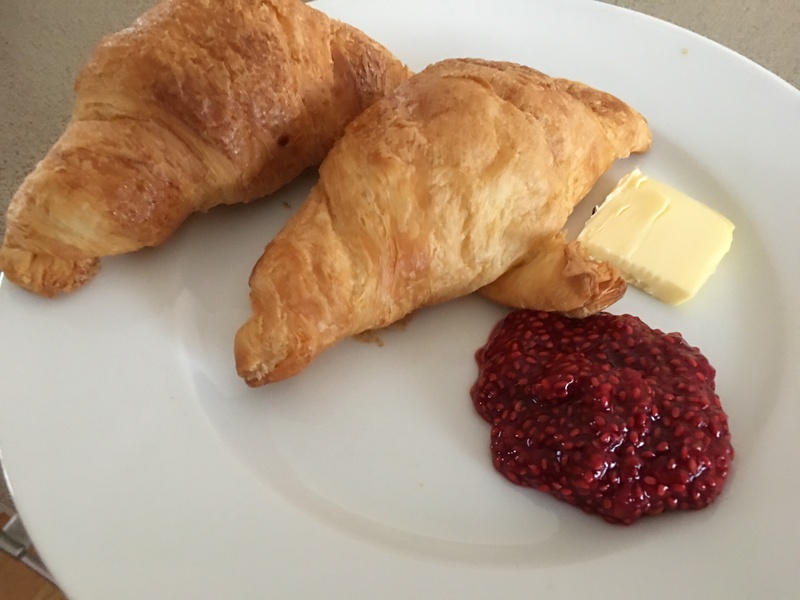 Raspberry jam is delicious on fresh bread or with croissants. It’s also the perfect topping for thick Greek yoghurt or as a filling for a sponge cake, with some whipped cream. And if you ever make too much to eat yourself, it makes the perfect gift. Place raspberries in a large heavy-bottomed pan with sugar and heat gently, stirring, until sugar has dissolved. A preserving pan is best. Bring to a rolling boil and boil for 5 minutes or until setting point is reached. Stir in a knob of butter which will dissolve any scum. Pour into hot sterilised jars. Place lids on while jam is hot. Store in dark cupboard and refrigerate after opening. To sterilise jars, wash thoroughly in hot soapy water, rinse in hot water, then drain. Microwave on High (without lids) for 2 minutes just before you pour in the jam, so they are still hot. Dry the lids and put them on immediately. Variations: For strawberry jam add the juice of a lemon when cooking the fruit. I like to use small strawberries for jam rather than the huge ones you can buy these days. For apricot jam start by cooking the fruit in 2-4 Tbs water (less if fruit is very ripe, more if not), then proceed as above, adding the juice of a lemon. Making Tomato Chutney was on the agenda this weekend. We were onto the last jar and running out is considered grounds for divorce in our house. A trip to the fruit and vegetable market in the last hour before closing provided some lovely ripe tomatoes at a bargain price. Matthew always helps with the chopping, so it didn’t take long to get all the ingredients in the pan. We have a cumquat bush in the garden which is well over 2 metres high. 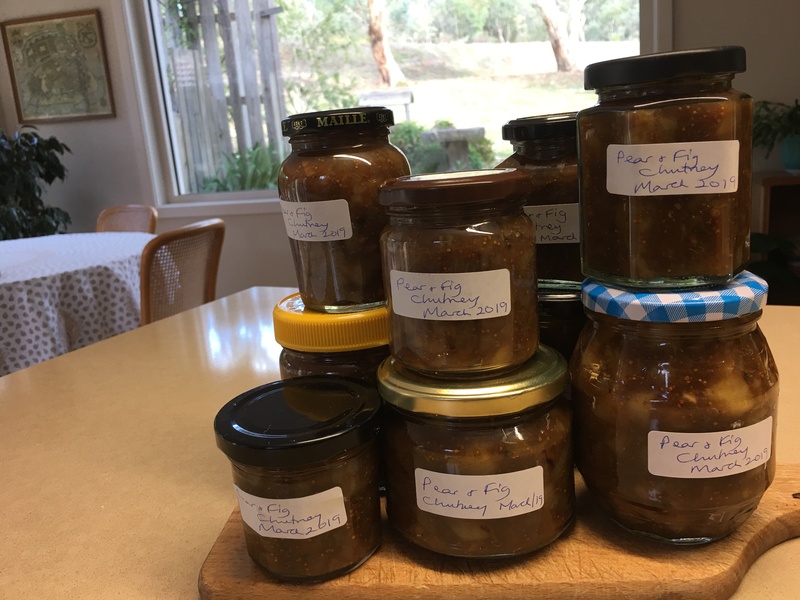 I picked several kilos of fruit a few months back and made them into marmalade as I do every year. The few ripe cumquats that I had missed were starting to fall to the ground as the new season fruit appeared. So while I was in the preserving mood I decided to pick them and see if there were enough to make something. 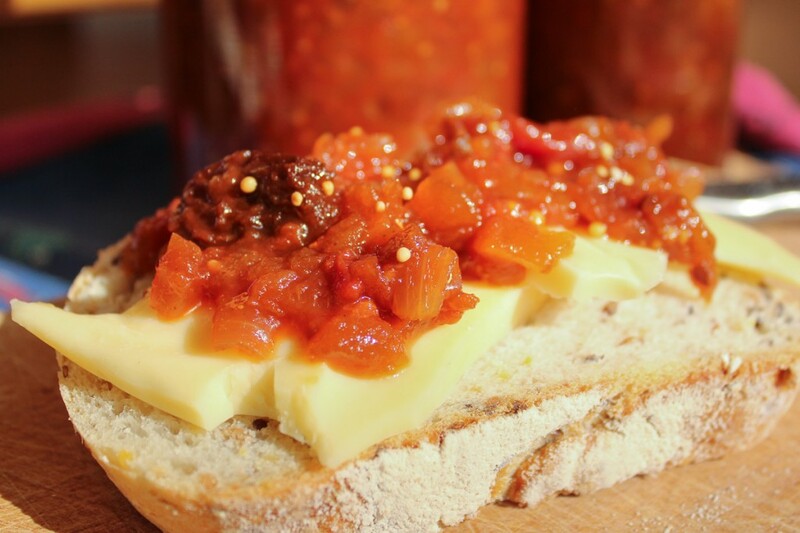 With just one kilo and a few ingredients from the pantry I came up with this tangy spicy chutney which tastes quite different to the tomato one. 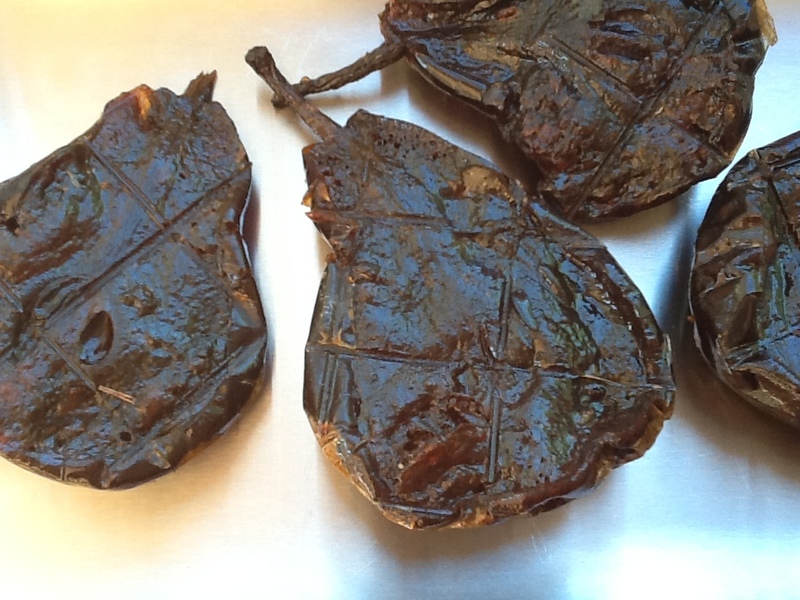 The dates add consistency and a delicious caramel flavour. Serve with ham, cold pork, duck or chicken. Cut cumquats into halves or quarters, depending on size and remove seeds. Place in a large heavy-bottomed pan or preserving pan with remaining ingredients. Place spices in a piece of muslin and tie firmly into a small bundle with string, then add to the pot. An old cotton handkerchief or a piece of any thin cotton fabric will do. Bring to the boil then simmer for about an hour, stirring often, until thick. Remove spice bag, cool it a bit, then remove any bits of chutney stuck to it and return them to the pot. Discard spices, wash out the cloth and keep for next time. Where would we be without the humble onion? White, brown, red, cooked or raw, pickled or fried, roasted or stewed. They’re an integral part of cooking around the world. 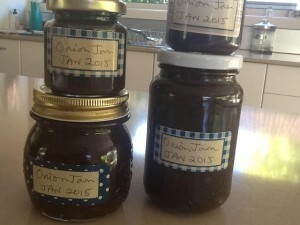 Onion jam is a delicious way to add some sweet onion flavour to all sorts of things. Use it in toasted sandwiches, on bruschettas, spread over the base of a savoury tart or pizza or served with a grilled steak. Peel and slice onions thinly. This takes no time at all with a slicing attachment on a food processor, but you can do it by hand. Heat oil in a large heavy-bottomed pan or preserving pan. Add onions and cook, stirring, for 5 mins or until they start to soften. Cover and cook for about 45 mins over medium heat, stirring from time to time. Remove lid and continue to cook for another 30 mins, stirring from time to time. Add sugar and balsamic vinegar, stir to dissolve sugar, then bring to the boil and simmer for a further 30 mins. Add thyme and salt and cook for about 10 mins, stirring often, until you have a thick, slightly sticky jam-like consistency. Place 3-4 standard jam jars or 6-8 small ones in the microwave, without their lids and zap for 2 mins on High. Fill jars with the onion jam then push a knife blade in, right to the bottom, all the way round, to remove any air. Seal with lids while hot. Will keep for several months in a dark cupboard. Refrigerate after opening. 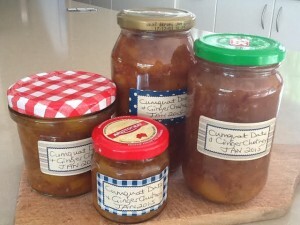 I’ve always made my own jams and chutneys from fruit we’ve grown or with donations from friends who have a glut. They are so much nicer than bought ones. 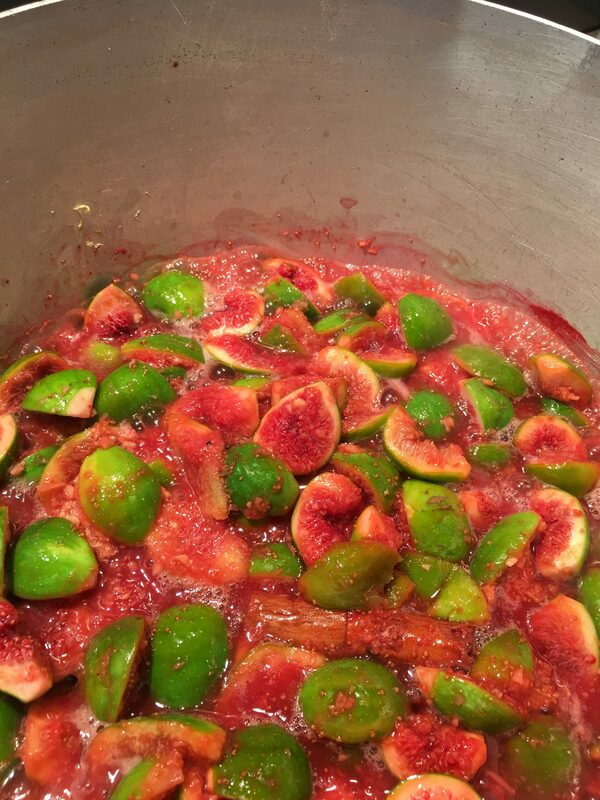 Sometimes I freeze the fruit and make the preserve later – for example peeled tomatoes for tomato chutney or sliced cumquats for marmalade. Matthew says he married me for my tomato chutney and that running out is considered grounds for divorce. That recipe, which came from my paternal grandmother, clearly formed a crucial part of my dowry! 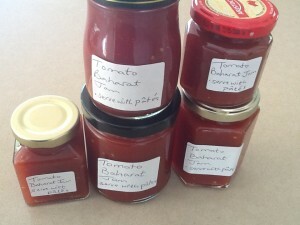 A recipe for a lovely bright red preserve called Tomato Baharat Jam appeared in a recent edition of Delicious magazine, as an accompaniment to chicken liver pâté. We found that it also goes superbly with cheese – especially brie and cheddar – and ham. I’ve doubled the recipe and cut down a bit on the sugar and I don’t think it’s necessary to discard the pulp and seeds, but you can if you prefer. This is the first time I’ve made it so I’m not sure how long it will keep without refrigeration. The ratio of sugar to fruit is not high, so I think it will keep for a month or two in a dark cupboard and should be refrigerated after opening. Chop tomatoes and place in a sieve to drain off any liquid. Discard liquid and place tomatoes in a large, heavy-bottomed pan with the sugar and spices. Simmer over medium heat, stirring from time to time, for 25 minutes. Add tomato paste and lemon juice, reduce heat and continue to cook, stirring often, for 20 minutes or until reduced and thickened to the consistency of jam or chutney. Season to taste with salt and pepper and remove the spices. The cloves might be difficult to find, so just leave them in. 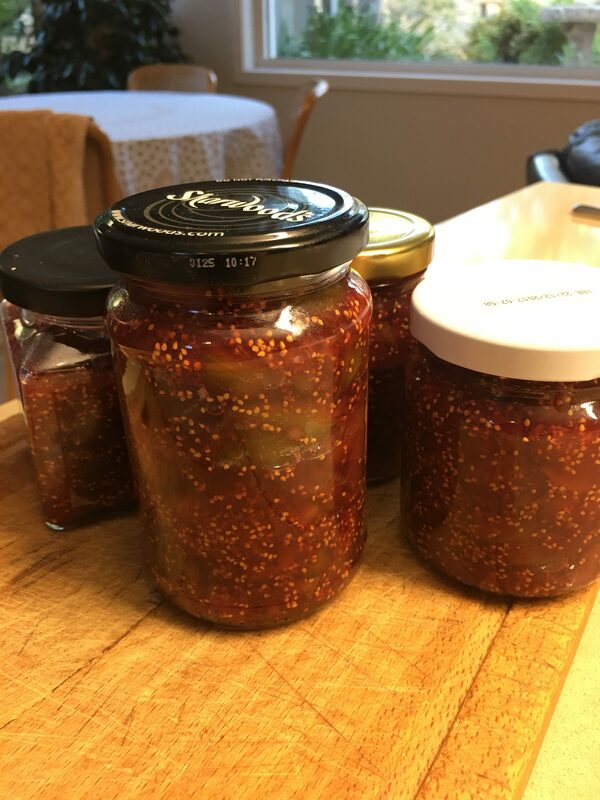 Place about 8 small clean jars in the microwave without their lids. Mustard jars and small jam jars are ideal. Heat on high for 2 minutes to sterilize. Fill jars with the hot tomato jam, seal with lids. 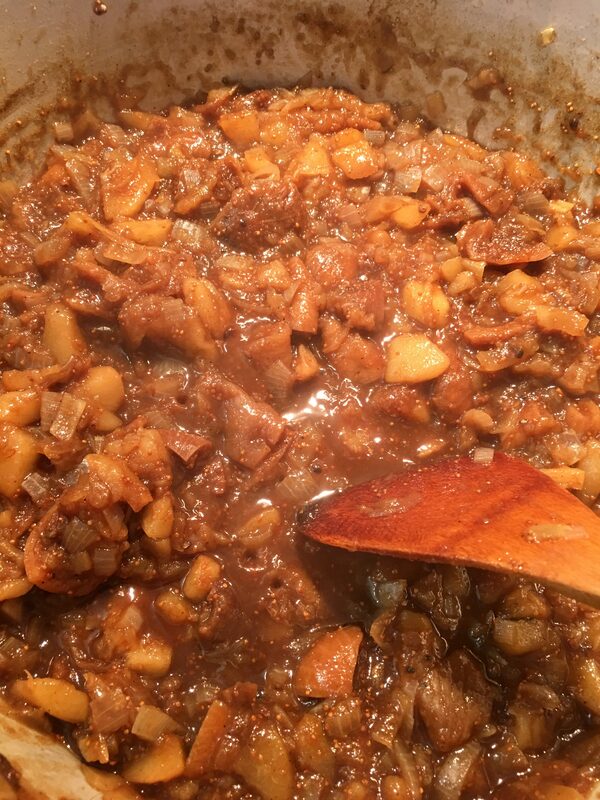 Note: if you don’t have whole spices use ¼ tsp ground cloves, 1 tsp ground star anise and 2 tsp ground cinnamon.